Cheung Tin Chi (Max Zhang), a Wing Chun master, who challenged Ip Man (Donnie Yen) and lost their closed door fight is now living simply as a store merchant with his son Fung, thereby continuing the legacy of the series. Veteran action director-choreographer Yuen Woo-ping aptly keeps the fighting and melodramatic angst in perfect balance. The story is somewhat predictable is helped by the addition of the villains Michelle Yeoh and Dave Bautista (who was also credited as co-producer). Set in the mid 60's, Tin Chi tries to do his best for his young son even though Fung gets tired of eating plain Congee and bread sticks for breakfast. While riding his delivery bike home he encounters gangsters bullying Julia (Liu Yan) who is trying to protect her friend Nana (Chrissie Chau) who didn't pay her opium bill. Tin Chi does the thing he does best. The British police chief is a dirty cop breaking up the fight and letting the thugs go. Later the thugs throw fire bombs at Tin Chi's store injuring Fung. Julia and Nana take them to the Gold Bar run by her brother Fu (Xing Yu) who is also a Wing Chun practitioner. Fu takes them in and Tin Chi works at the bar for his keep. The police are bribed to say the fire was an accident. Tin Chi knows better and burns down the opium den in retaliation. 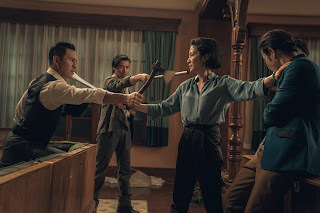 Meanwhile Tso Ngan Kwan (Michelle Yeoh), the leader of the Cheung Lok gang tells her gang that she wants to turn her operation into a legitimate business. This does not sit well with her brother Tso Sai Kit (Kevin Cheng) who ran the opium den and makes a deal with a heroin dealer to distribute the drugs to the bar street where visiting sailors, working women and people looking for a good time brings the street alive. Of course Tin Chi discovers the operation and tries to stop it. This causes a problem for the major operator Mr. Davidson (Dave Bautista) who uses his cover as a Western restaurateur and philanthropist to his advantage. He even rejects Ms. Kwan's attempt to support his charity because she is a known crime boss. As the story starts moving in the predictable direction, with character deaths, limbs cut off and spectacular martial arts sequences, the weak story is forgiven just for being rewarded by Max Zhang's fighting skills. Look for Tony Jaa in a special cameo role as Sadi the warrior. Julia advises Tin Chi to find what it is find out what he is good at and what makes him happy. Which of course is Wing Chun which will hopefully bring us more continuing adventures and more inventive fighting.